Seoul, South Korea – August 24, 2011: Vitria Technology, Inc. announces that Samsung Electronics has selected its M3O Operational Intelligence Suite to present a holistic view of its worldwide business operations. With a global consolidation of its ERP systems, Samsung needed a complete and timely picture of events, data, and relationships. Additionally, Samsung required a solution that would be compliant with its existing Standard ERP Widget repository. Samsung’s operations personnel were having difficulty achieving visibility into operational data as the data resided in multiple systems and silos with various points of ownership. With the common operating picture provided by Vitria, Samsung was able to quickly derive decisions using real-time data. As a result, Samsung’s operations personnel can now view and understand the operational health of their company for any given moment along with a projected and historical status. Vitria also possesses the unique ability to handle a large variety of data at high volumes, in real-time. In contrast to platforms built around simple tabular data, Vitria is able to process richly structured and semi-structured data due to its native support for XML. RSS feeds, social media activity streams, and most sources of internet data can be analyzed at a rate of millions of messages per minute, providing decision-makers with the real-time insight to take immediate action based on business policies and processes. 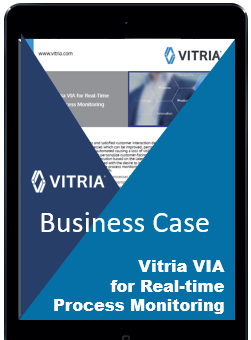 To view real-time data, Vitria’s easy-to-use dashboard creation capabilities empower business and IT users to create intuitive, role-based dashboards. Even more so, Vitria’s dashboards make it easy for users to immediately act on real-time information with the click of a mouse, leveraging the power of Operational Intelligence.